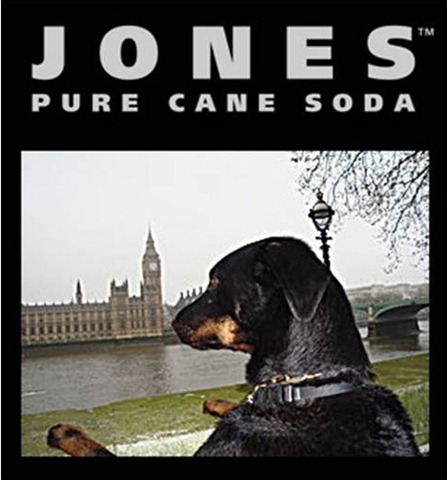 Near our place in Seattle is a Jones Soda office, so we walk past it quite often. I recently learned that you can upload your own photos and they might get printed on the labels on their bottles. I recently uploaded the one of Milo overlooking the Houses of Parliament (click on that to vote for it). Also check out Milo’s typical look when running at Bishop’s Park. Maybe one day, you will be in a grocery store in the US and you’ll see Milo on a bottle! Milo and I are still having problems walking on the other/right-hand side of the sidewalk (aka, “pavement” to you English folks). I am also regularly being asked for directions from strangers when we’re out walking. Other than those two things, I guess we’re settling into Seattle life and life in the loft, which are both very nice with all the sunny weather we’ve had. I keep adding to the Milo on the iconic tour of Seattle photo album and just added ones with Milo and a parking-meter car, another with the Space Needle, Ride The Ducks, the Seattle Streetcar, and a view from Kerry Park on Queen Anne hill. Bob and Sylvia, neighbours from our old houseboat days, now have an electric boat. 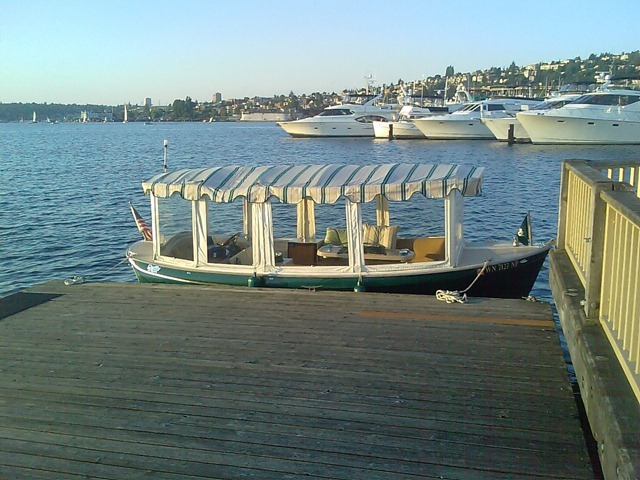 A Duffy 18 foot electric boat, to be specific, which is perfect for Lake Union. Fremont is at the North end of the lake so they boated on down to South Lake Union (our new ‘hood) and picked us up. 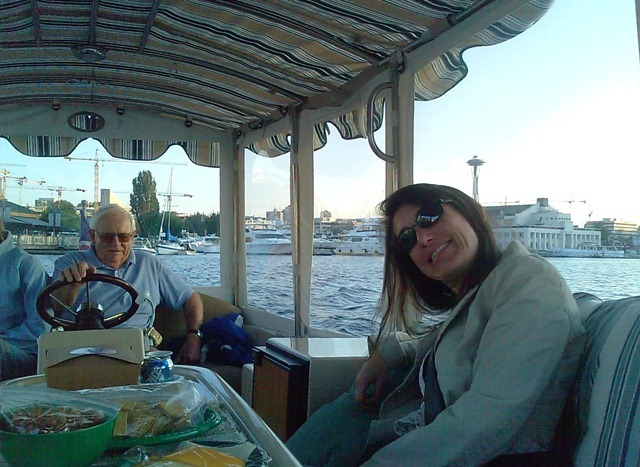 We had dinner at Dukes (fish taco… mmmm) then cruised around looking at the houseboats. New ones have gone up since we moved off of the lake a few years ago. They’re even more expensive now, but I’d still like to live on one again some day. Now that Milo is a Seattleite, I have begun his iconic tour of Seattle, since he already had his iconic tour of London. I will add to it as we meander Seattle. 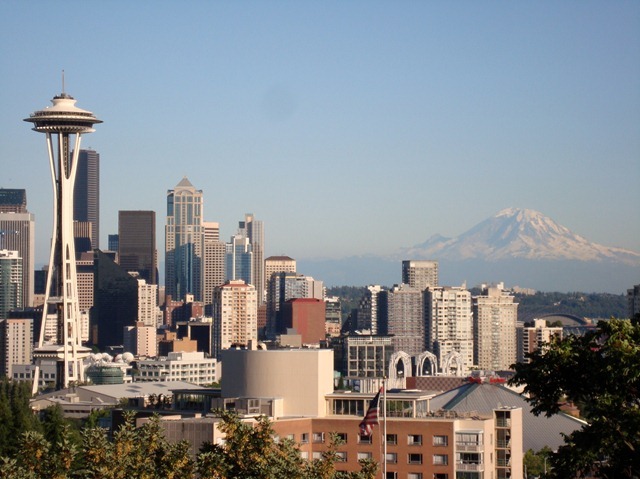 Local experts will notice the Fremont Troll and many other iconic representations of Seattle are missing. There must be some! We’ll eventually add numerous odd photos of Milo so you too can feel like you’re busy walking him around the city. 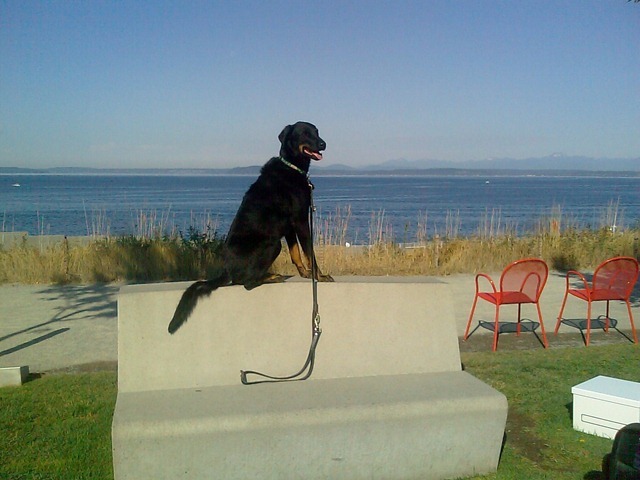 On my first day back in Seattle for the summer, I took Milo on an early morning walk to the Olympic Sculpture Park (about a 25 minute walk from our loft). As you can see in the picture, I had Milo do a bit of agility training. After I got him off of the top of the bench, a guy walking past us said “that was a great shot”. I’m not sure if he took a picture of Milo or if he was referring to the picture I took. 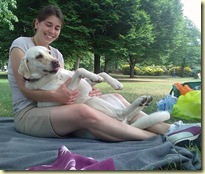 Either way, it is a nice park that I suspect I’ll be walking Milo to quite often. I will be living and working in Seattle over the summer (Lorie & Milo are already there) and I fly out from London on Friday. To celebrate and say goodbye for the summer, I went out with some of my closest friends in London. These are also the friends who have graciously been letting me couch surf for the last couple of weeks, so you could say I owed them too. 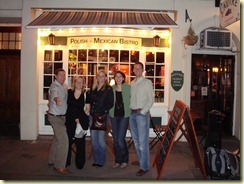 We decided to try L’autre, the Polish & Mexican restaurant, which is amongst a few good restaurants in Shepherds Market. 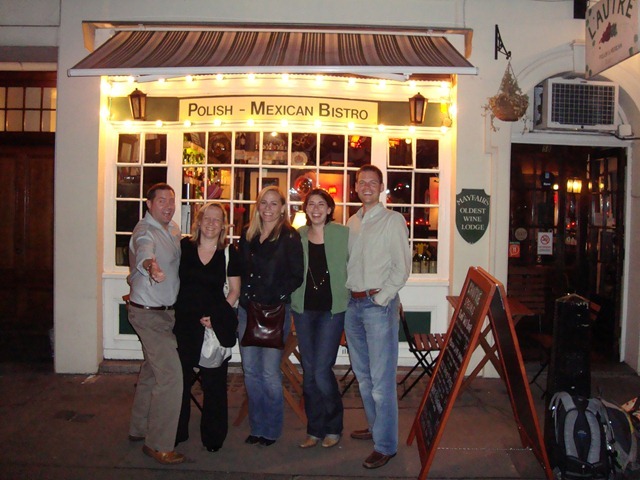 I think we were all pleasantly surprised that both the Polish and the Mexican dishes were good. I think we all wanted to see some weird combination of the two types of food, but we were all relieved that we didn’t have to select something like a chicken & sauerkraut taco. The band Chicago has a song called “Saturday in the park” and the lyrics start off with “Saturday in the park, I think it was the 4th of July.” I can now say I’ve been there and done that, since a few of us hung out in Hyde Park for the 4th of July this year, which was on a Saturday. There were no fireworks, but watching other people in the park was good entertainment. 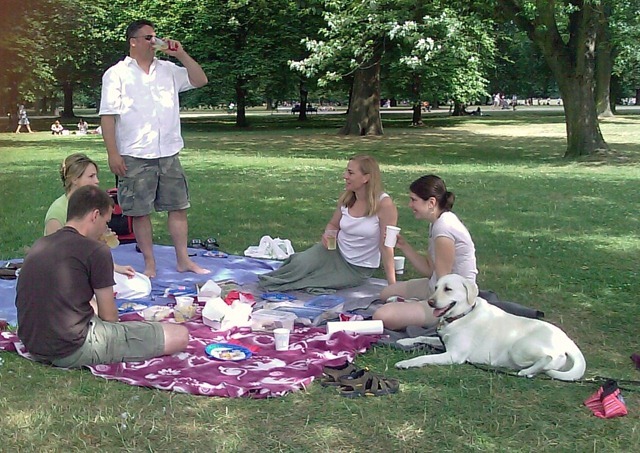 At various times, we had people around us playing cricket, football (soccer), and frisbee. We didn’t do any of that though, since we were just hanging out and relaxing.